Nicely updated two story offers inviting wrapped around front porch, new replacement windows, new furnace-duct work-etc. plus new roof. All new fixtures in both bathrooms, new tiled floor and counter tops in remodeled kitchen, and all new flooring throughout. Freshly painted interior, new textured ceiling in dining room, sun room, and fenced yard. Close to school, park, and conveniences. Binghamton High School Pre-School, High School / Public 3 1.92 mi. Calvin Coolidge School Pre-School, Elementary School / Public 4 0.49 mi. East Middle School Middle School / Public 2 0.11 mi. Benjamin Franklin Elementary School * Pre-School, Elementary School / Public 1 1.3 mi. Port Dickinson Elementary School * Pre-School, Elementary School / Public N/A 1.67 mi. Theodore Roosevelt School * Pre-School, Elementary School / Public 1 0.7 mi. 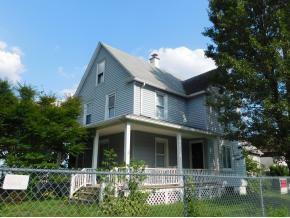 26 Abbott Street, Binghamton, NY 13904 is a 2 bedroom, 1.5 bath single family home was sold for $70,000.